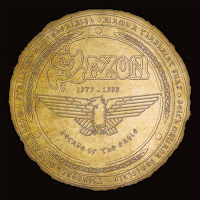 O Saxon lançará a coletânea "Decade of the Eagle 1979-1988" no dia 01 de dezembro na América do Norte. O material estará disponível em versão simples e deluxe com CD+LP. "Stallions Of The Highway", "Big Teaser", "Backs To The Wall", "Militia Guard", "Wheels Of Steel", "747" (Strangers In The Night), "Suzie Hold On", "Motorcycle Man" (live), "Strong Arm Of The Law", "Heavy Metal Thunder", "20,000ft" (live), "Dallas 1PM", "And The Bands Played On", "Never Surrender", "Denim And Leather", "Fire In the Sky" (live), "Princess Of The Night", "Power & The Glory", "This Town Rocks", "The Eagle Has Landed", "Midas Touch", "Sailing To America", "Crusader", "Devil Rides Out", "Back On The Streets", "Rockin' Again", "Rock N' Roll Gypsy", "Broken Heroes", "Waiting For The Night", "Rock The Nations", "Northern Lady", "Battle Cry", "Ride Like The Wind" e "Red Alert". 1LP & 1CD Tracklist: "Backs To The Wall", "Wheels Of Steel", "747" (Strangers In The Night), "Strong Arm Of The Law", "Denim And Leather", "Power And The Glory", "Sailing To America", "Rock N'Roll Gypsy", "Waiting For The Night" e "Ride Like The Wind".